If you’d like to organize information in your notes, you can create a table. Click Insert > Table, and then move the mouse over the grid to select the size of the table you want. Click the lower-right highlighted cell. 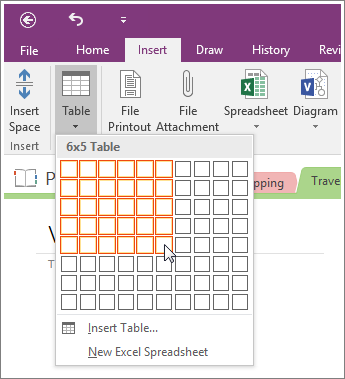 Note: When you add a new table on a page, OneNote reveals the hidden Table Tools tab on the ribbon. Here, you can select and format the table. To return to these tools again at any time, click anywhere within a table on a notes page. You can also access most of the table commands by right-clicking any table cell and then clicking the Table command. In your notes, click the location where you want to insert a table. On the Table menu, click Insert Table . In the Insert Table dialog box, enter the number of columns and rows you want. You can create a table more quickly by drawing it. On the Standard toolbar, click Insert Table , and then drag the pointer down and to the right to specify the number of rows and columns that you want. To show or hide table borders, click in any cell in the table and then, on the Table menu, select or deselect Show Borders. If you need to change the format or size of the table, see Format a table.